Is your birthday a big deal to you? I’m the kind of guy who doesn’t like to celebrate his birthday. I like to say, “If you want to give me a present, for heaven’s sake don’t wait until my birthday!” I also say, “On my birthday I’ll be one day older than the day before.” I like the idea that every single day of my life is the most special day, not just the one day marking my birth all those years ago. My wife, on the other hand, loves celebrating her birthday. To her, it’s a supremely important day, and she reminds me several times well in advance to make sure I don’t forget. And I never do. I think of it as one more way I can bring some happiness into her life—one of my highest priorities. Sometimes, though, pulling off a successful birthday for her isn’t so easy. To make sure I hit the bulls-eye, I always ask, “Honey, what would you like for your birthday this year?” Simple, huh? Uh-oh. Waterfalls can be expensive, I thought. When I asked her to be more specific, she said we could pick out a nice one at Lowes, The Home Depot or a store specializing in water features. I’d never seen a ready-made one that wasn’t tacky, and paying to have one built could run five figures—or more. This was beginning to sound like a major request. The bottom line: I decided to build the waterfall myself. I had never built a water feature before, but once I built—all by myself—a two-level 500-square-foot deck with built-in seats, which turned out great. If I could do that, I felt confident I could build a waterfall. 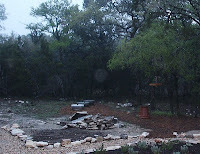 Besides, our home is situated on a limestone ridge and there were rocks of all sizes all over our property. I’d dig a big hole in the chosen spot, then move a bunch of rocks from where I didn’t want them to where I did want them—the waterfall site (see photo at right). To make a long story short, the waterfall turned out great. But not without a major effort on my part. I ended up moving over two tons of rocks—by hand. On the plus side, I didn’t have to work out at the gym during that period. On the negative side, one of the rocks weighed 400 pounds. I used a handcart, but do you have any idea how hard it is to maneuver a rock that size onto a cart? I tried and failed over 20 times before I finally got it onto the cart. It took me four hours to figure it out. I just kept trying until something worked. Then I had to haul it up the hill. I thought the cart would break. Then there was the plumbing, which turned out to be a much more delicate task than I envisioned. The pipes come from the pump inside the hole to around the side of the waterfall, then up the backside and split into two openings. All these unsightly white pipes have to be covered with lovely rocks. I had to redo the pipes three times before I got it right. And there were the leaks… Well, you get the idea. It was a lot of work. In retrospect, I have to say it was the most difficult project I’ve ever attempted. It took me two months of unrelenting effort (and $500 worth of materials) to finish it. But as you can see in the “after” photo, the result was worth it. If you squint, you can see the water falling. It looks great, and the landscaping has grown up around it. It attracts frogs and birds. At night in the spring and fall, we hear the sound of falling water from our open bedroom window. Best of all, my wife still says it’s best birthday present she’s ever had. I don’t want to mislead you. I can be just as lazy as the next guy. I’ve said “Screw it, I’ll do it later” at least a million times. But during my life I’ve learned that sometimes some really hard work is needed to get what I want. The price in effort may be substantial, but it almost always pays off. Like the time over 30 years ago, when I had to submit my dissertation by a specific date. I was living in Germany at the time, so I had to finish the writing, proof it, revise it, copy it and send it in time for my committee for review before the deadline. My wife and I planned a vacation to the Canary Islands as a reward. It took a lot of hard work, and it meant back-to-back all-nighters before hauling the copies to the post office. We were so tired we slept the first two days of that vacation. A few months later I was at Duke University shaking hands with the members of my committee, and they were calling me Dr. Coates. Special moments like this can make you believe in hard work. If you’re like me, you know that what you want most isn’t going to be given to you. You’re not going to win the lottery, and you don’t have a rich uncle who’s going to pass on a big inheritance. No, what’s really going to happen is that you’re going to choose which race you want to run. Then you’ll pay the price. You’ll commit yourself to the kind of total effort that will give you a chance to win. You’ll concentrate all your energies on the challenge, and you’ll give the best you have to give. You know that this—not the lottery—is the closest you’ll ever come in life to winning big. Invest great effort, and you’ll earn great dividends. 1. Choose a project that means a lot to you. Most people have some huge, intimidating project that they’ve been putting off. Maybe it’s clearing some land. Maybe it’s remodeling a room in your mother’s home. Maybe it’s writing a book. Maybe it’s starting a new business. 3. Make a firm commitment to complete that step. 4. Resolve to do the best job you can. 5. Do whatever it takes to create a result you’ll be proud of. 6. When you're finished, write down three things you learned from the project. With more lightning and less thunder, you’ll blow through the hard things. Ever bang your head against a seemingly impossible problem for hours on end? When I find a challenge such as this, one of my preferred problem techniques is to punt it all to the next day. Sometimes just sleeping on a problem seems to allow your mind to work on it quietly in the background. The next day, I wake up, and start on it fresh the next morning... and frequently I'll find a new insight that allows me to solve the problem. Sean, I love that strategy. I do the same thing myself. Sometimes I don't think as well when I'm tired, and the next day has a different context and perspective. It really is the best present I ever received--and worth more to me because of the love that went into it. What a beautiful gift and testament of your affection for your wife, Denny. Your labour of love is reminicent and every bit as WONDERful as that of the Taj Majal.